As part of the recent map kiosk release, we've simplified the colors shown by default on maps and status boards. Available spaces will show as green, with all other spaces shown as a dark gray. Availability colors on the room display and web dashboard (besides maps) will not change. Accessibility. Red/green colors on the kiosk/map views are difficult to distinguish for folks with color blindness. While custom color themes might work for the web dashboard, Status Boards intentionally allow less customization to make sure they are always readable so we can continue to release new features quickly without breaking presentation for existing customers. Easy to find free space. This change makes the maps easier to scan when adding more things like desks and points of interest. Too many colors at once makes it harder for people what’s free to use right now, and leads to a frustrating user experience. Select a space to drill into its current status, and see red, yellow, or green labels indicating if the space is free, or when the space is free next. Labels will continue to show for all rooms regardless of availability. Why only show available rooms? We've prioritized the green availability colors because the main job of status board is to help with "Which room can I use right now?" around the office. 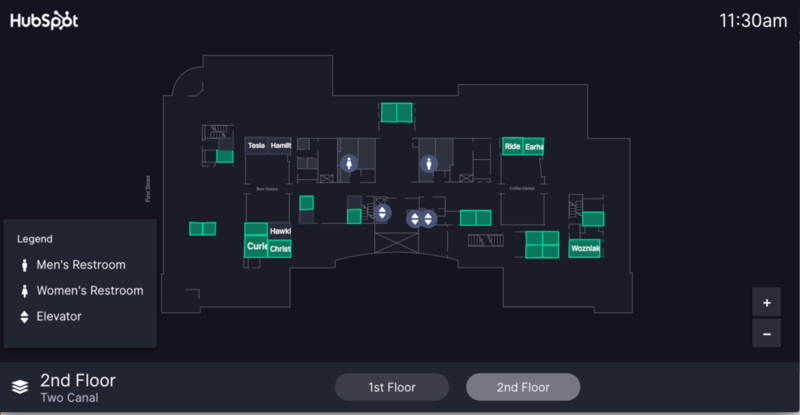 For the folks interesting in seeing detailed summaries of each room's current status, you can still select spaces on the map to browse more. Need more of a firehose? Actively monitoring the day-to-day happenings of the office is generally a better job for the web dashboard. Over the coming days, you will see changes to the scheduling status board mode as well as the maps in the web dashboard for consistency. Many of you shared concern about showing yellow and red on the boards, especially in offices where confirmations often got skipped and the yellow "booked" color would show up more often than the red "In Use".